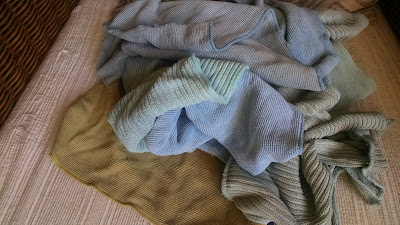 However, even with the antimicrobial property, these rags start to stink after awhile. But don't worry! If this happens to you too and you think your cloths are ruined, they are not! I have a very simple solution for you. I hate dishrag stench. 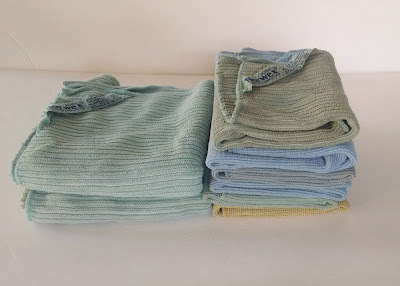 It is really unpleasant to grab a dishrag to clean something, only to have it leave your hands stinking! 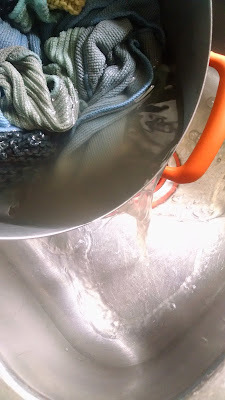 This happens more for me in the summer where the humidity of our area makes it hard to let our dishcloth dry overnight. I have found a simple solution to this problem. 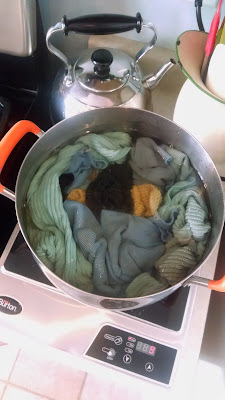 When I notice my cloths aren't smelling fresh right out of the wash, I simply throw them in a pot and boil them! That's right, I boil them. Throw those rags in a large pot, fill it with water, and turn it on to boil. Do NOT add any detergent. Make sure there is enough room for the rags to move around a little. Bring that pot to a boil and let it go for 5 to 10 minutes. Stir the rags around a little bit every once in awhile. After time is up turn it off and let everything cool down for a little bit. After the water cools down a little, you are going to pour off most of the water. This is when you will be unpleasantly surprised at how dirty the water is! After all, I put 'clean' rags in this pot! How is the water this brown? Next, throw the rags in your washing machine. 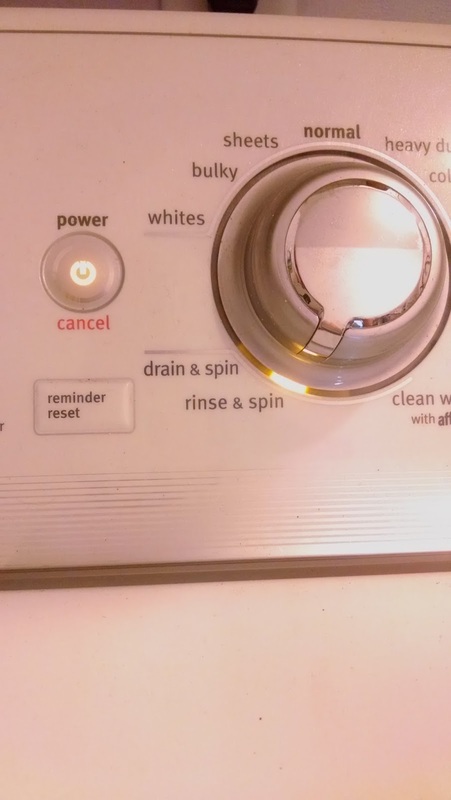 Set that machine to 'rinse and spin'. Do not worry about washing them again with any detergent. 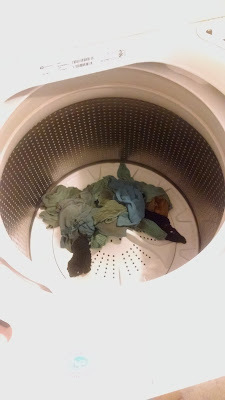 When the machine is done cycling, throw them in the dryer and dry like normal. DO NOT USE FABRIC SOFTENER! If you have done this in the past, STOP! 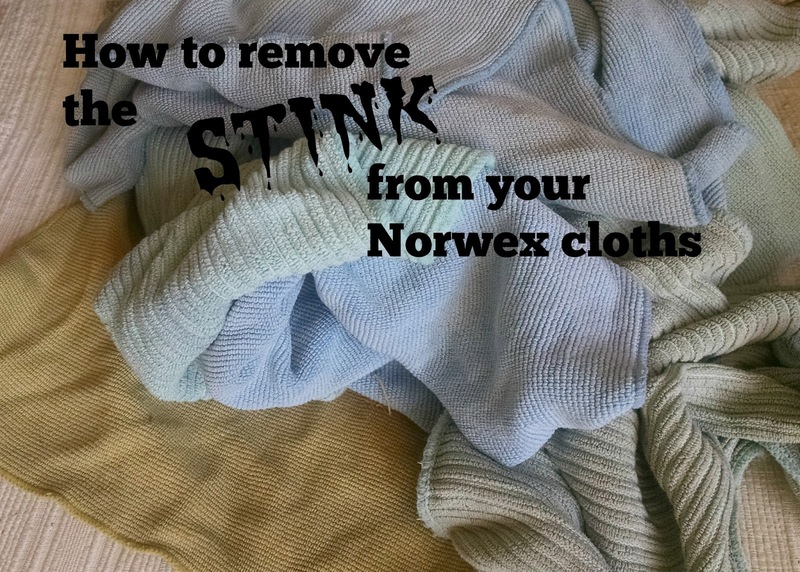 Your Norwex cloths should now smell clean! Fold those babies up and admire your handy work. You may need to repeat this process every few months. But it's no biggie! You now have a simple solution to a stinky problem. *Do not throw them in the laundry pile wet. Allow them to dry completely first. *Use a different cloth every day. *Don't leave your cloth in a wet heap at the bottom of your sink. Wring it out and hang it by the sink between uses. *Rinse your cloth well in hot water after each use. The Norwex enviro cloth is a very tightly woven microfiber cloth. It really grabs the dirt and locks it in. That's why when you boil it, your water gets so dirty, even with clean cloths. Boiling also helps remove detergent build-up on your cloth which can lead to the stink. *Disclaimer: I am not a Norwex consultant, nor was I compensated in any way for my opinions. This post is a result of my own usage and research of the Norwex product.